Home » Crafting » DIY Sugar Scrub Recipe for Soft Kitchen Hands! DIY Sugar Scrub Recipe for Soft Kitchen Hands! Sugar scrub is something I have always thought about making. It’s easy enough and I knew I most likely had all the ingredients, I just never really gotten around to it! Today I decided to give it a chance and create my own DIY Sugar Scrub Recipe to share with all of you! I love getting rid of the dry skin. There are two recipes below, so make sure you scroll down to get both! I am all about inspiring the at home novice and making a sugar scrub at home requires little to no skills. If you have a spoon to stir with, you can now move forward! 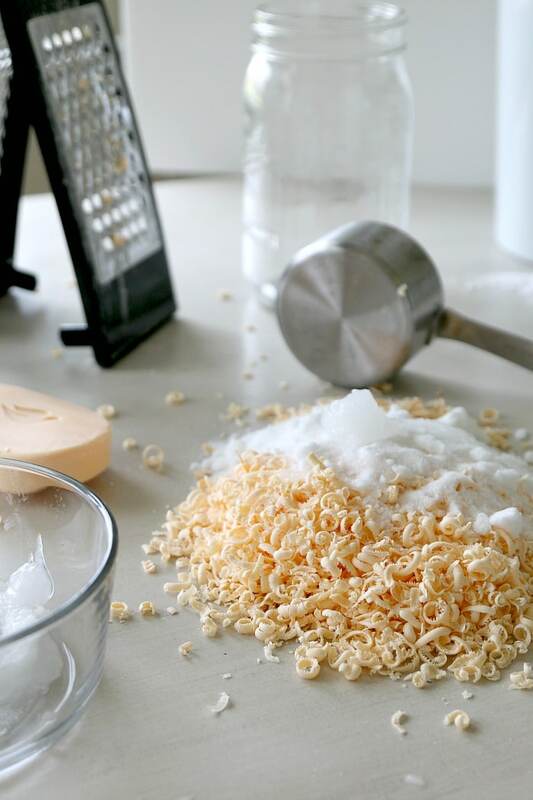 This first recipe is more in-depth with 6 household ingredients. Before we go into this easy recipe, let me state that I picked up these adorable jars with lids and spoons at Hobby Lobby. They were about $2.50 (this varies on the jar and size) and I picked out the perfect size for the kitchen. You could also use a bowl, a large shell, a mason jar – the possibilities are endless. If you put this jar by the sink in the bathroom or kitchen just take care that it has a spoon and is high enough to keep moisture out of the jar naturally or your scrub can clump. TIPS: Consider flavors/smells like lavender, peppermint or lemon depending on what you are using this for. Pour 3/4 cup white fine grained sugar into a bowl. Because I was using this for the kitchen, I also chose to add 1 tbsp baking soda to help with the cleaning properties. 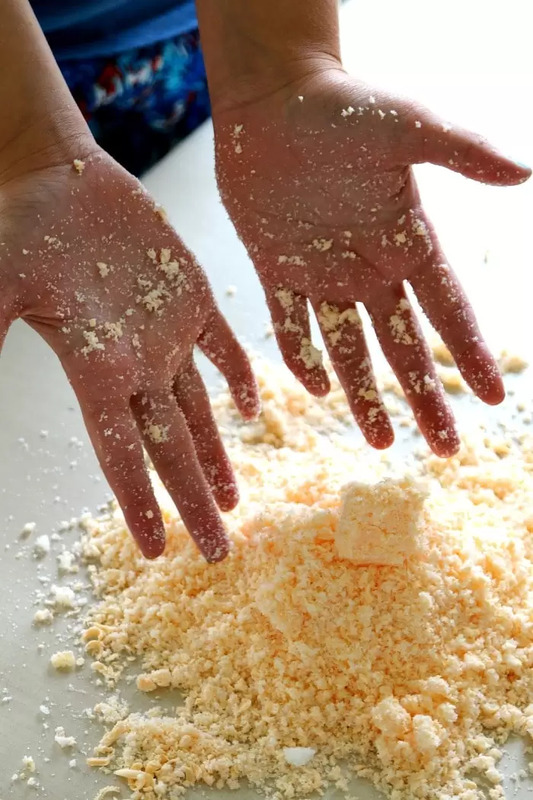 Use a cheese grater to grate out 3/4 cup of Shea Butter shavings. I really like Shea butter for how soft it makes your hands and is a must in this recipe! You can see that I did not pack it down when measuring. I also shaved it on a piece of paper thinking it would make it easier to dump, but since it’s a soap consistency, all it really did was stick to the paper. Shaving it on a glass plate or parchment paper would probably be smarter. Tip: You can buy Shea Butter in block form (as well as many soap kinds on Amazon or hobby lobby. My large block was $12 but I used a craft store coupon to get it down to just over $6). Now pour 2 tbsp of Olive Oil or Coconut Oil on top of your sugar scrub. Personally, I like fruity smells when it comes to the kitchen, but many like peppermint, almond, vanilla, or citrus. This choice is yours! I put about 7 drops of the oil onto the top. I used grapefruit oil, but there are a lot of essential oils that can really help here. Make sure you read about the strength of each oil so you do not overdo it! Add approx 5 drops of yellow liquid food coloring to spice up the color a bit and make it more “kitchen” like. This is totally optional and is for looks only. If you choose to use a scent, you can add a more appropriate color to “match” your scent (like peppermint and red, etc). Mix all your ingredients together. I found this easiest by just using your hands to mix it up. Once mixed up just scoop into your jar with a spoon. All Done and now you can make tons of your own sugar scrubs in any flavor – lemon, grapefruit, and orange is so fun for the kitchen! You can also make a 2 ingredient homemade hand scrub!! As a parent, I can without a doubt tell you that your kids will LOVE washing their hands when there is a scrub at the sink. 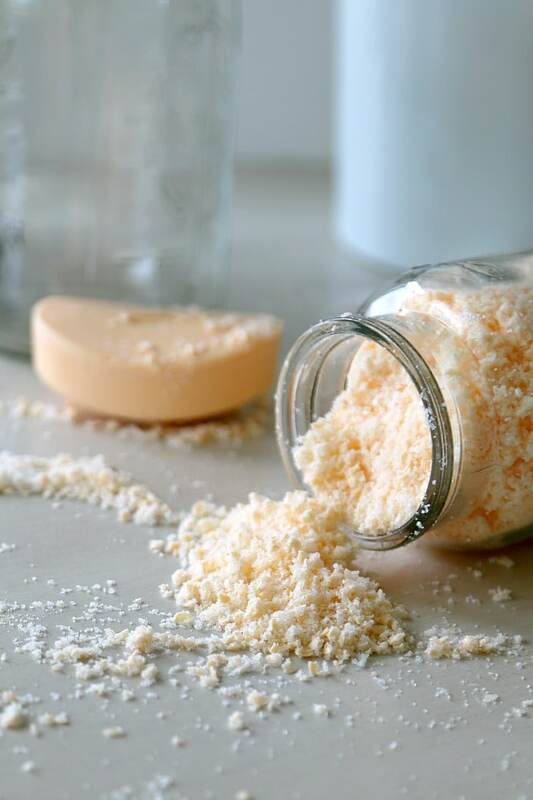 Not that the above sugar scrub recipe needed to be any easier, but it can be! This 2 ingredient version is great for a gift and perfect to add in every bathroom of the home- as a bonus, this scrub can also be used in the tub and in the shower! For some people that do not want to use essential oils or any coconut oil in the recipe, this works better and is just as easy. You can start with our easy to understand DIY Sugar Scrub Video- this is the 2 ingredient version. 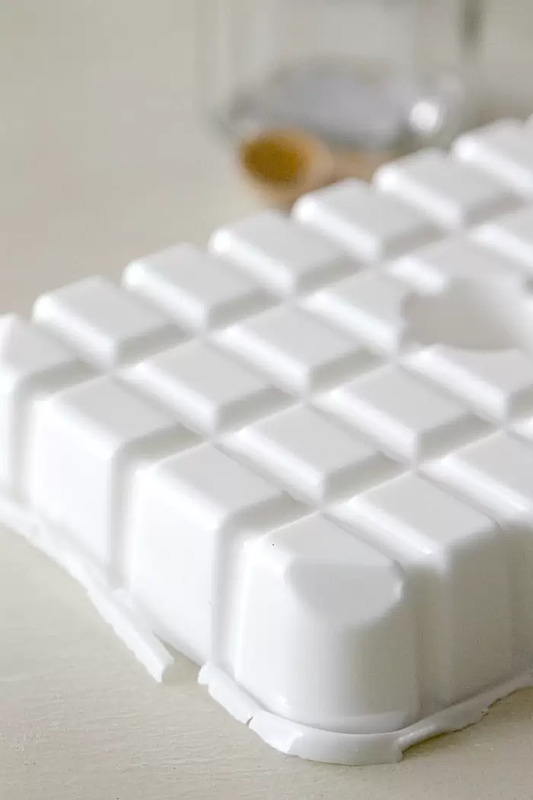 Shave your Dove soap bar down to little spirals. You can use 1 or two bars, just adjust your sugar as necessary. I always find shaving soap pretty fun. You could easily leave these shavings in their own jar for an easy scoopable soap directly but, in this case, we are going to add 1 1/2 cups of sugar to our mixture to get that exfoliation property. Simply use your hands to mix the two ingredients together. Your spirals will break apart even further and leave you with finer granules of soap. When will this expire ? Should it be stored a certain way? Just trying to figure out how much time I can make them beforehand . I am going to have to try this. My hands are so dry in the winter time. They have been a little better this year since I have been putting on this Shea Butter cream every night at bedtime. I pinned this so I will have the recipe – Thanks. My hands are always dry and this sounds so soothing. Featuring when my link party opens up tonight. This looks awesome! My hands could really use this–pinning it right now! I would love it if you’d link this to the Frugal Crafty Home Blog Hop–our readers would LOVE to see this! Thank you! What a good idea! My hands are always dry after cleaning, and this would be a great way to keep them soft! Thanks for linking up to Do Tell Tuesday! I have always used 2 parts sugar and 1 part oil ~ olive, grapeseed, apricot, sunflower, (no almond I am allergic). I haven’t used baking soda in my scrubs (but it is known for restoring pH balance so that is a wonderful idea, I have used cornstarch because it makes your hands extremely soft. Epsom salt is good in baths because it draws out (toxins ~ metabolic waste) so a salt scrub can be made too! Personally I buy high grade essential oils (the co-op has them and organic section at grocery stores often carry them) and here is why… The skin is an organ and our first line of defense and a lot of the oils I have found say directly on the bottle do not ingest… this means that it is not food, or therapeutic grade, and far from organic thus they are stating in not so many words that their oil is high in chemicals used to ward off pests. Oh and lets say you are in a pinch and you want a quick way to get those hands soft, all you need is some crisco, a bowl of hot water, and some gallon size plastic bags ~ bread bags work too! Fill the bowl with hot water, slather on some crisco ~ you want this a little thick, place the bags over your hands and place in the bowl. Let your hands sit for a couple minutes. Pull off the bags and rub remaining crisco into your hands. The heat from the water opens your pores allowing your skin to absorb the crisco rapidly. You can add a bit of essential oil or even use coconut oil if you are worried about the crisco smell! Enjoy! Ooh I love the Crisco fix for hands…I’m doing this with my coconut oil tomorrow! TY!! I have made a similar hand and body scrub with coconut oil and sugar. I love your addition of baking soda. And your jar decor is too cute!! That spoon is a great idea. I love this! I’ve bought several different sugar scrubs in the past. I think I am going to have to try to make my own following your recipe. I’m pinning this. Thank you. Such a great idea! I made a lemony handscrub once, and it was tons of fun. Pinning!! I love making homemade sugar scrub and I love this one for the kitchen. I came over from the Weekend re-Treat Link Party. Pinning! Practical and lovely! What a great DIY gift! Also, something I need myself! I have shared this on Pinterest, love this! Have you tried using brown sugar in place of white? Your photos are beautiful and adore the tiny hearts holding the spoon. I can NOT wait to do this with Gaby and Kennedy this weekend. Well, let’s just keep our fingers crossed that I can keep Kennedy from eating the shea butter and painting the house with food coloring! This is perfect for dry winter skin. I’ll have to give it a try! This is such a great idea as I always have super dry hands after washing dishes and the like, especially this time of year. I love how it even looks so pretty on your counter top! This looks great and your photos are amazing! I’m going to try this out! We just made homemade soap and picked up the supplies at Michaels. So easy! Oh, yes, this would be great with a lemon scent in the kitchen. My hands are so dry right now, too. I cannot wait to try this! I love how you can make your own scents (even combining scents), and that you KNOW the ingredients. Very clever! Gosh, I could totally make that. I love lemon scents in the kitchen. Does the sugar in there make your hands sticky at all? This looks really easy and perfect to soften hands. I’ll have to try and make some for my feet and keep it in the bathroom.